I've been clearing out my iPhone's "camera roll" and came across this one - taken back in March outside of Taichung. And with our road-tripping vacation up California's coast later this week, it's the perfect time to post. A thoroughly modern "oasis" (as Illinoisans call 'em) off the highway. Delicious foods too, even though I didn't recognize a thing. Lots of fish-related items. 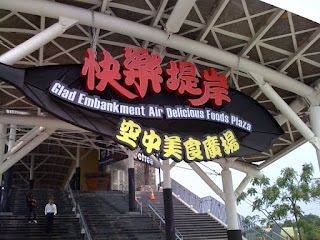 Not sure how glad the embankment air was though, I didn't have time to check it out.